It took 15 years for Peyton Manning and Tom Brady to do this on the same day, and they're probably not happy about it. 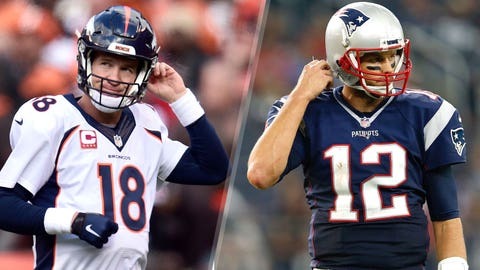 The New England Patriots’ Tom Brady and the Denver Broncos’ Peyton Manning have been NFL starters together for 15 years now. They’re two of the most decorated quarterbacks in league history, combining for five Super Bowls and seven NFL MVP awards. However, after more than a decade in the NFL, Brady and Manning had yet to throw pick-sixes on the same day. On Sunday, they did for the first time ever, according to the Elias Sports Bureau. Brady’s was his first (and only) interception of the season, though it could have easily been avoided. The pass went off of teammate Julian Edelman’s hands and into those of Indianapolis Cots safety Mike Adams, as he took it 14 yards to the house. Manning’s, on the other hand, was his ninth of the season. Coincidentally, it also came on a tipped pass. Manning’s throw bounced off Broncos running back Ronnie Hillman’s hands, and Cleveland Browns linebacker Karlos Dansby took advantage of the miscue. Dansby ran it back 35 yards to the end zone for the score, putting the Browns up 21-16. It took 15 years for Manning and Brady to throw pick-sixes on the same day, and they both came on miscues from their receivers. That’s just the way football goes.